We interrupt this program to bring you ... Three Special Opportunities! 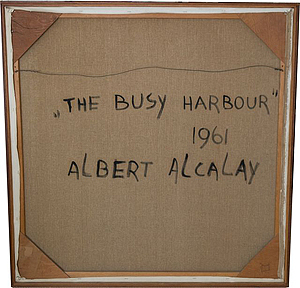 Opportunity #1 - A dramatic signature work, A Busy Harbor, by the late renowned artist, Albert Alcalay, is especially representative of Alcalay’s style in the early 1960’s. This expressionist artist is known for his ability to convey his own emotions and to evoke emotions and vivid associations in the viewer. 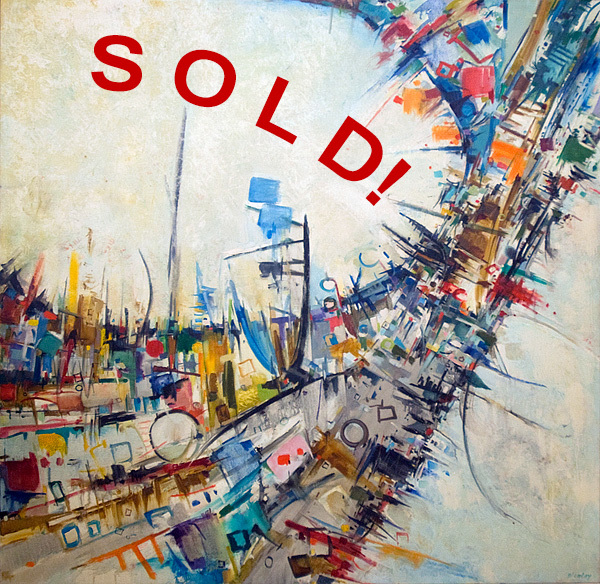 The sweeping arc of line encircling the harbor, the diagonal thrust of the land, and the dizzying array of patches of color, geometrical motifs – circles and squares, arcs and vertical lines that pierce the bay and jut from the land....all contribute to the exuberance and energy of this vibrant, pulsating painting. Mr. Alcalay conveys his pleasure and excitement with the busy summer activities of the harbor in Chilmark, Martha’s Vineyard, where he spent his summers. As Alcalay remarks in the documentary about him, Albert Alcalay: Self Portraits (being shown on 72 public television stations), his use of the circle, and circular motifs expresses his feeling of joy and happiness. His use of saturated colors – blue, red, pink, orange, green, yellow, and black – is also very typical of Albert Alcalay’s paintings throughout his life. Indeed, these pure colors express the basic optimism and sense of hope which he brought to each day of his life.